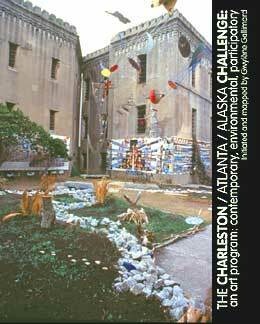 As an environmental / contemporary / community art project, the Charleston/Atlanta/Alaska Challenge has involved artists and educators in a process which has included thirteen communities or classes. 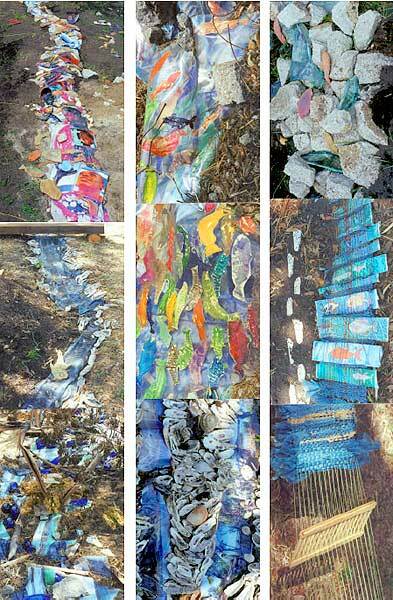 Its culminating event is a collaborative, large scale, participatory installation, representing a fictional river flowing from Alaska to the Low Country. From indigo-dyed kudzu transformed into a waterfall, foot paths turning into animal tracks, chains of natural materials designing a 25′ dreamcatcher, long undulating lines of text, to shelters, Father Sky, video, sound and a river of dreams… the whole environment is anchored with six murals about the Yukon river, a slide projection, works by some of the participating artists and the massive architecture of a 200 year old landmark: the Historic Charleston Old City Jail, which had been abandoned for 60 years. It is now the American College of the Building Arts. The project was initiated and mapped by Gwylene Gallimard.